Aerospace manufacturing in Baja California is one of the main engines of growth for the economically vibrant Mexican Pacific Coast state. Between the years 2014 and 2017 the aerospace industry ranked fourth in Baja in its ability to attract US $208 million dollars in foreign direct investment (FDI) to the sector. The industries that came in ahead of aerospace manufacturing in Baja California during those years included the energy, truck and tractor and passenger vehicle industries. This is according to data from the Mexican Ministry of Economics. One of the most recent investments made in the state was a US $9 million dollar investment by Chino, California’s Kern Engineering and Manufacturing. The company will engage in the production of parts for aircraft engines and for space-related technology in its plant in the border city of Tecate. It is the intention of the firm’s directors to create 350 direct jobs in its first year of operations and to conclude a meaningful expansion within its first five years of its initiation of operations. Kern Engineering is one of five Mexican aerospace suppliers that maintain a presence in the city. Beyond aerospace manufacturing in Baja California, the industry as a whole in all of Mexico is approximately 16% more competitive in terms of cost when compared to the same sector in the United States. Mexico has also made itself more competitive in recent years because of the creation of training programs that the country has implemented for its workforce. In addition to a growing pool of skilled Mexican labor, other benefits that accrue to companies that engage in aerospace manufacturing in Baja California, as well as in other production centers in the country (Queretaro, Nuevo Leon and Sonora, for example) include a strategically beneficial geographic location and a network of free trade agreements that gives Mexican manufacturers preferential access to important global markets. According to Mexico’s foreign investment promotion agency, Pro Mexico, the sector that includes aerospace manufacturing in Baja California, as well as in the other areas, is characterized by a diversity of activities. The aerospace industry in Mexico is comprised of companies that are involved in manufacturing, maintaining, repairing, engineering, designing and testing of aircraft parts for both commercial and military aircraft. Mexico consolidated itself as a global leader in the aerospace sector in 2016. From 2010 to 2016 industry exports increased by an average 14% each year. Total exports topped US $7 billion, while imports were just under US $6 billion. This means that, in the aggregate, Mexico had a trade surplus in the aerospace industry of just over US $1 billion. During this period of significant growth in the aerospace industry in Mexico, Queretaro was the recipient of 47.9 percent of foreign investment in the sector. Aerospace manufacturing in Baja California attracted 13.9 percent, while Chihuahua was a recipient of 11.2 percent of total aerospace investments in the country. The goal that state officials have for aerospace manufacturing in Baja California in 2018 is to attract US $1.5 billion dollars of foreign direct investment to the sector. This figure is a bit higher than the US $1.4 billion that the sector attracted in 2017. 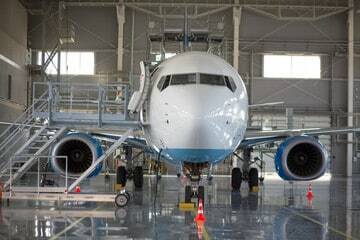 Currently, ninety aerospace companies have a presence in the entirety of the state of Baja California. These companies employ a total of 33,000 jobs. It is expected that in the coming years, this number will see an annual growth of ten percent. In addition to capturing new foreign investment, aerospace manufacturing in Baja California has expanded significantly through the growth of companies with existing facilities in the entity. Both Esterline and Hutchinson Aerospace announced significant plans for growth at the 51st Paris Airshow in 2017. Esterline made a commitment to grow its workforce of approximately 1000 by three hundred individuals. This would represent an additional investment by the company of US $35 million dollars. The funds would be used to expand its ability to supply its aerospace customers with more sensors, connectors, and plastic molded parts. In the case of the French aerospace manufacturer, Hutchinson, the company announced that it would invest US $40 million over a period of five years. With this new capital the company will increase its capacity to produce aircraft anti-vibration and sound dissipation systems. In addition to Esterline and Hutchinson, the San Diego-based manufacturer, Spectrum, announced that it would initiate a project to manufacture an executive jet, the S-40, in the city of Mexicali, Baja California.